Anovia Head On is a range of haircare containing head lice repellents suitable for everyday use by the whole family. We received a 3 in 1 conditioning shampoo and a 3 in 1 conditioning spray to try out. With both children attending nursery/school, the last thing I want is for them to catch head lice, as with having long hair myself I know it is something that can be passed on easily and I really don’t want to experience it myself. Anovia Head On uses 97% natural ingredients and contains a blend of three essential oils to help prevent, treat and repel head lice. These are Tea Tree, Eucalyptus and Neem Oil. I do think the products do smell quite strongly of these oils which is fine by me especially if I know head lice are rife, although Miss M did find it a bit strong at first. The shampoo is rich and creamy, very easy to lather up and leaves hair clean. You can definitely tell it has conditioning properties and it leaves the hair soft. For Miss M’s curls, she definitely needs the conditioning spray as well, which is easily sprayed onto damp hair enabling me to gently detangle her hair before it’s fully dry. I found the Anovia haircare products simple to use and left hair soft and clean. Due to the essential oils used in this product the head lice repellent isn’t harsh, but leaves a gentle pleasant smell in the hair. Even if you choose not to use these everyday, I always keep them in the bathroom cupboard for those times when a head lice warning letter comes home from school and then use this shampoo for a few weeks while the outbreak is going around to prevent my children from catching the lice. Fingers crossed we have all been head lice free since September, even though I know they’ve been around the school already this term. Let’s hope it stays that way! All reviews are my own and my family’s opinions and we received Anovia Head On in order to write the review. 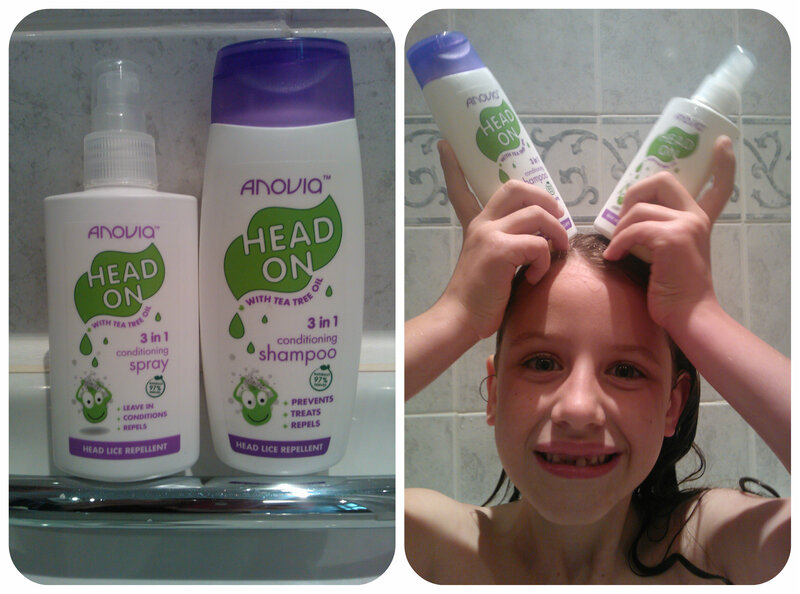 This entry was posted in Beauty Reviews, Reviews and tagged Anovia, head lice, shampoo, spray, tea tree by Fiona Martin. Bookmark the permalink. Kim Carberry recently posted…Half Term Halloween Fun In Northumberland…. These sound like a great idea. Although we have been lucky enough to avoid them so far, I know the time will come! If we can prevent it before it happens I think this would be well worth having in stock! Great idea! I should stock some up and if anything happen, I have it!